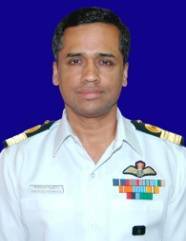 Rear Admiral Philipose G Pynumootil, took over as Assistant Chief of Naval staff (Air) on promotion. An alumnus of the Lawrence School, Lovedale and the National Defence Academy (67th course), he was commissioned in the Indian Navy on 01 Jan 1986. A rotary wing pilot qualified on Sea King 42 B / C and Alouette helicopters, he has served as Flight Commander INS Delhi, Senior Pilot - Marine Commando Flight & INAS 330, and commanded the carrier borne ASW Sea King Squadron, INAS 330. He was also the commissioning Commanding Officer of the Naval Air Station, INS Shikra. A former Instrument Rating Examiner on Sea Kings, the officer has flown extensively during Operation Pawan, Sri Lanka and Operation Restore Hope, Somalia. Prior to taking over his current appointment, he served as the Principal Director of Aircraft Acquisition. The Flag officer has commanded the 1241 RE corvette, INS Nashak, the missile corvette INS Kirpan and the Guided Missile Frigate INS Brahmaputra, besides doing a tenure as Executive Officer of the Guided Missile Destroyer INS Delhi. The officer was awarded the Nao Sena Medal for his tenure in command of INS Brahmaputra. The Flag Officer has undergone the Staff Course at the DSSC, Wellington, Tamil Nadu and the Higher Air Command Course at the College of Air Warfare, Hyderabad. He is a post graduate in Defence Studies and holds an M Phil (Strategic Studies). He is an alumnus of the Royal College of Defence Studies, London and attained an MA (International Relations) from Kings College, London. He is married to Priya, who has worked with various NGOs and taught at the Naval Maritime Academy, Mumbai. They have a daughter who is pursuing her graduation in English Literature. He is a keen swimmer who enjoys reading and listening to music. Hailing from a service background, his (late) father, a fighter pilot retired as an Air Marshal in 1987. His elder brother was Naval Aviator who died in an Islander crash in 1985. His sister is married to a brigadier from the Armoured Corps.